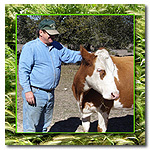 Travis and Leigh Sebera have been raising and producing grass-fed beef since 2004. Located in the Texas Hill Country, Red Barn Beef is committed to raising cattle with the end product in mind - lean, healthy, beef. Our cattle are raised and finished on grass, consume no grain products, receive no chemicals, no hormones, no antibiotics, and no pesticides throughout their lives. Red Barn Beef cattle are allowed to engage in their natural behaviors while on the pasture. There is sufficient space and shelter to enhance their health and they receive gentle handling to limit stress. Growing sustainable means the cost - environmentally and ecologically - do not exceed the production attained. Raising cattle sustainably is using local sources for food (hay), grazing without chemical fertilizers and not overusing the non-renewable resources in any level of production. The USDA has developed an exhaustive list of standards to be certified "organic". Many of the standards are well thought out and beneficial to the consumer. Because of the costs of verification and audits required by the USDA our small family ranch cannot afford to be certified "organic". We raise our animals according to these standards but do not participate in the expensive audit process. Your guarantee of our methods is in the invitation to visit our cows. The Texas Organic Farmers and Growers Association (TOFGA) call local growers marketing locally the next organics. Red Barn Beef is a small family farm. We are the labor force, working the cattle, tending the land. By raising and selling locally we use less oil or gasoline to transport our product and cause less pollution to our Earth. 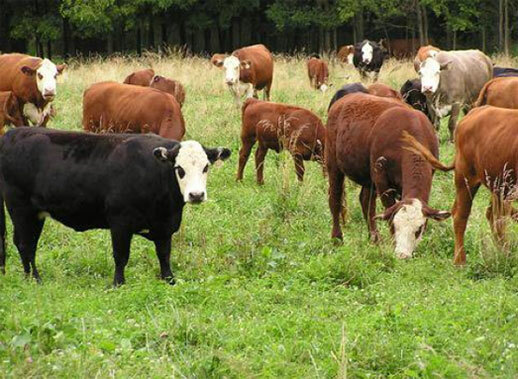 Reduction in greenhouse gasses and global warming reduction as well as improved air and water quality are by products of pasture raised beef. In addition, our pastures provide habitat and forage for wildlife.